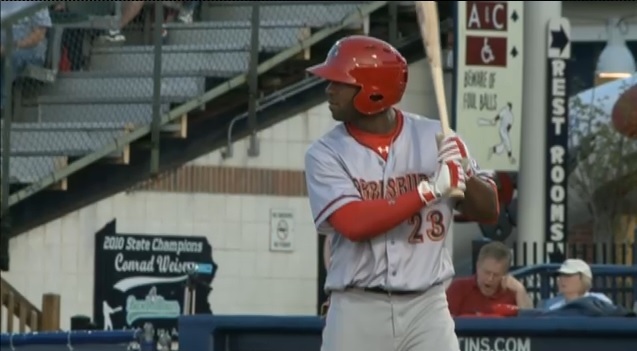 (PR) Marshall Kelner / Reading, PA – Brian Goodwin’s bases clearing double capped a five-run fourth inning, and the Harrisburg Senators went on to defeat the Reading Fightin Phils 7-4 in the opener of a three-game series. The contest was scoreless until Harrisburg’s big fourth inning, and the five runs they scored were the most in a single frame this season for the Sens. Destin Hood delivered an RBI double to put them on the board and a big error by Reading third baseman Tommy Mendonca allowed another run to score and extend the inning. Goodwin would take advantage, as he lined a 3-2 pitch down the right field to drive in three runs and break open the game. Nathan Karns was solid on the mound for the Senators and earned his fourth win, tossing six innings and allowing seven hits and three runs. He didn’t walk a man and struck out six, including the final three hitters he faced. In the ninth with the Senators leading 5-3, Jerad Head provided some insurance by launching a two-run homer to left, his fourth of the season. The bottom of the ninth wasn’t without drama. Reading loaded the bases and brought the tying run to the plate in the form of Tyson Gillies. He singled through the right side to score a run, but Destin Hood gunned down Mendoca at the plate to end the game. • Prior to the game, Jeff Howell was reassigned to the club while Craig Manuel was sent to Hagerstown. Reliever Tyler Herron was also promoted from Potomac and Pat Lehman was placed on the disabled list. • The five runs the Senators scored in the fourth was their biggest one-inning output of the season. • The Fightin Phils are stuck in a tailspin that has seen them lose 16 out of their last 20 games. • The Phillies are Reading starter Greg Smith’s seventh professional organization as he played for the Diamondbacks, A’s, Rockies, Yankees, Red Sox, and Angels as well. • Two of Jerad Head’s four home runs this season have now come off Reading reliever Hector Neris. This entry was posted in Recaps and tagged Brian Goodwin, Destin Hood, Greg Smith, Harrisburg Senators, Jeff Howell, Jerad Head, Nathan Karns, Pat Lehman, Ricky Hague, Tyler Herron. Bookmark the permalink.